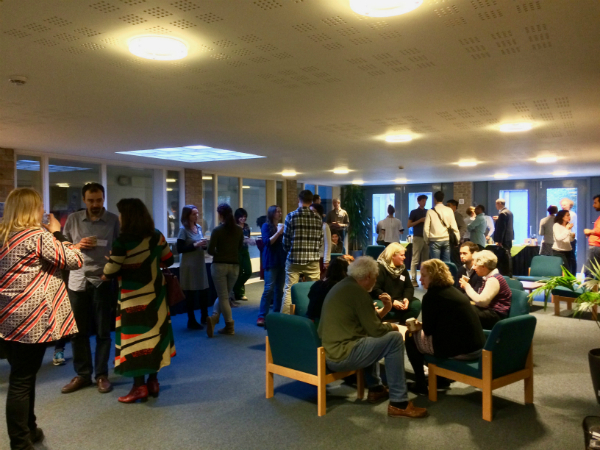 The 2017 BFE One-Day conference, 'Listening to Difference': Music and Multiculturalism, was hosted by the Faculty of Music, University of Cambridge on the 21st of October 2017. Energised by a clear theme and a helpful preliminary literature review in the Call for Papers, the conference aimed (amongst other things) to examine the terms ‘multicultural’ and ‘intercultural’ in the light of recent immigration and increased political attention to migration and difference. Specifically, the conference aimed to explore the relationship of music to these terms. The conference focused its attention on how, in the UK and beyond, music ‘unveils social relations in multicultural societies at the level of day-to-day experiences’ (CFP). The conference organisers asked for presenters to consider how music transcended or reinforced difference in settings we describe as multicultural, and they were rewarded with a diverse and engaging set of responses. The papers presented across the day covered both contemporary and historical contexts and methods, and took us on intellectual journeys across multiple countries and political and economical contexts. The day’s first speaker, Dr Toby Martin (University of Huddersfield), utilised a social media platform’s video chat facility to perform live with his musical collaborator, and to demonstrate some of the principles of their collaboration which he had introduced in his paper. This sparked a discussion amongst the delegates about tuning negotiations and other challenges presented by the interaction of musicians and instruments with different aesthetic systems, getting to the heart of the question of how music transcends or reinforces difference in multicultural settings. In their co-authored paper, Dr Laudan Nooshin and Professor Amanda Bayley discussed how the term multicultural could mean many different things in diverse contexts; this became a recurring theme throughout the day’s proceedings. Indeed, several of the presentations that followed reiterated the idea that multiculturalism as a term is not always sufficiently clear in its meaning or use to be as effective as we need it to be in our research. A group of cosmopolitan musicians from different countries may have much more in common, Dr Nooshin argued, than they might have with musicians from rural areas of their own respective countries. She thus questioned the use of the term ‘multicultural’ as a marker of difference when commonalities of greater significance may exist. Dr Victor Vicente (Chinese University of Hong Kong) considered Macau’s Lusofonia multicultural festival, its ethnically diverse audience, and the festival’s resultant expressions of both collective affinity and cultural alterity. He also reiterated some of the recurring challenges of ethnographic work; festival ethnographies are formed from large and necessarily incomplete data sets, and are accompanied by the age-old issues of coding, storage and maintenance. 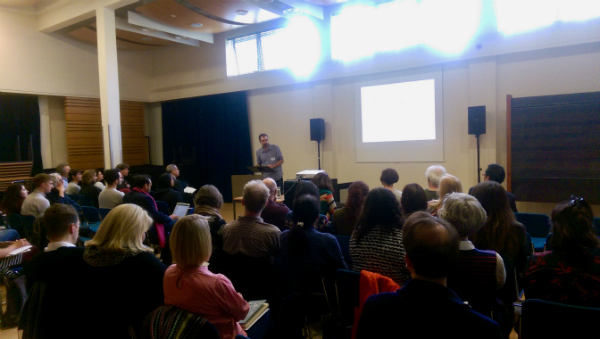 Dr Phil Alexander (University of Glasgow) put contemporary conceptualisations of the multicultural into relief with his historical descriptions of music and immigrant identity amongst Glasgow Jews of the early 20th century. 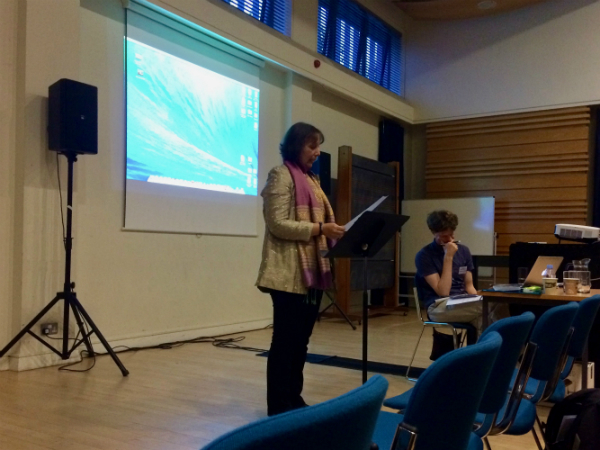 Kate Walker (University of Sheffield) spoke about how music can be used expressly as a tool of soft power. Her presentation discussed how Wadaiko is used to promote British values in Japan and how these values are articulated with other state conceptualisations of Britishness. The paper of Luke Fowlie (University of Montreal) highlighted the use of music as a tool for retaining and transmitting cultural heritage, for increasing visibility, and for fostering conviviality in the intercultural context of Cameroonian cultural and development associations in Montreal. Dr Ulrike Präger (University of Illinois at Urbana-Champaign) focused on a Syrian peace choir and their performance of a song, 'Janna', and its expression of resistance to the current political leadership in the country. This provided the context for her examination of the voice of the individual refugee and their motivations in the use of music to negotiate difference. Raquel Campos Valverde (London South Bank University) presented a theoretical discussion of how music exemplifies difference, and how it has the potential to act as a tool for the articulation and contestation of regional and national identities. She asked why people post music online using social music and what others made of these postings. She placed her discussion in the context of recent political events in Catalonia and Spain, and examined the responses of research participants to these events online. Dr Laryssa Whittaker (Royal Holloway, University of London) discussed how musical and linguistic differences were 'accommodated' in the context of a post-apartheid South African church. She proposed that, in their drive beyond mere multicultural ‘coexistence’, linguistic differences sometimes created greater tensions for worshippers than musical differences. Our conceptualisations of the relationship between ‘indigenous’ and ‘immigrant’ and how a celebratory musical multiculturalism might be usefully calibrated formed one of the core themes of Professor Tina K. Ramnarine’s (Royal Holloway, University of London) keynote paper. In a talk full of musical examples, Prof. Ramnarine highlighted the challenges that music scholarship faces from contemporary political discourses and presented ‘multiculturalism’ as a term under pressure in contemporary times. By probing the idea of the ‘stranger’ – a figure she described as marking the intersection of multiculturalism and postcolonialism – she drew together several theoretical disagreements regarding the term ‘multiculturalism’. Moving us towards an 'analytical calibration of difference, xenophobia, and immigration', her paper resonated with points raised throughout the day. Over the course of the day, it became clear that speakers found the term 'multicultural' to be useful, complex, but sometimes troubling. Many conference discussants agreed that the term can transmit multiple meanings in different musical contexts. While the conference set out to explore those meanings and contexts in greater depth, discussions after paper presentations returned to the question of the efficacy of the term ‘multiculturalism’ and whether other terms (such as ‘culturalism’) may instead perform a more effective role. Future publications from the research presented at this event will likely provide further conclusions in this regard. Congratulations are due to conference host Dr Matthew Machin-Autenrieth (University of Cambridge) for organising such an interesting and engaging conference. Thanks are also due to the conference committee members and administrators: Dr Byron Dueck (The Open University), Dr Stephen Wilford (City, University of London), Dr Thomas Hodgson (King’s College London), Dr Rachel Adelstein, James Gabrillo and Daniel Jordan (all University of Cambridge); and to the BFE and the University of Cambridge for their support of the event. The day ended with a conference dinner where organisers, speakers and attendees continued the discussion in a more informal setting over food and a glass of wine.